This is the first in a series of interviews from the Iraq Energy Institute looking at Iraq’s emerging digital economy, beginning with a discussion on how Iraq can sustain its tech ecosystem and support clusters of innovation across the country. IBBC is holding a Tech Conference in Baghdad in April 2019, please email London@webuildiraq.org for further info. Iraq’s tech hubs, from Fikra Space to Erbil TechHub and The Station in Baghdad have quickly outgrown their roots as co-working initiatives. These efforts have become the building blocks of new ventures, and foreign investors are increasingly looking at the next steps. 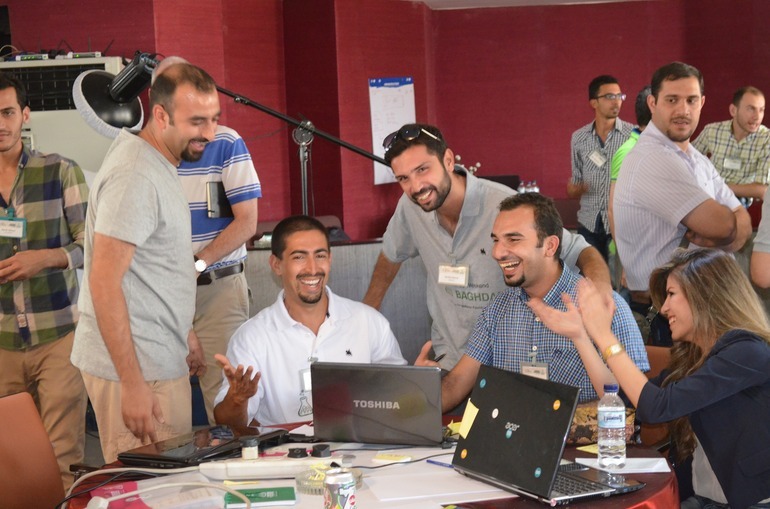 Entrepreneurs have created distinctly Iraqi tech solutions for Iraqi problems with companies such as Miswag and Sandoog cleverly adapting their platforms to overcome local challenges. As the region builds its own Ubers and Amazons such as Careem and Souq.com, the potential for creative disruption arguably has far more power than in the developed world. If trends continue, we could yet see a new opportunity to fight resource dependence, improving governance and displacing the economically statist models that have dominated the region for decades. As an early investor in the new generation of Iraqis working in tech, Mohammed Khudairi, Managing Partner at Khudairi Group, spoke with Iraq Energy Institute on the opportunities and barriers ahead. IEI: Khudairi Group is branching out from multiple sectors to invest in tech in Iraq, is that correct? MK: Yes, this is an effort that’s supported by the family business which is Khudairi Group, which operates on several different verticals in Iraq. But it’s really more of a personal endeavor, it’s something I believe in, and my father and brother believe in. And then, others will be interested, for example, I know Uber has been exploring an entry for the past year. So, it’s an exciting time for tech in Iraq. Of course, I’m not leaving my day job yet because I couldn’t really financially justify that and we’re doing well with our core business. But it’s something I hope to be spending more time on in the next 3-5 years, as I am pushing forward with Iraq Tech Ventures, which is a self-funded VC arm, which is going to be looking at 2-3 investments per year in Iraq. IEI: That’s really exciting. Because it would be tempting when we look at these ventures from the Western perspective to see it as a sort of charity to support. But actually, I don’t think that’s what real entrepreneurs want– they want seed funding, they want to pitch their ideas and win support on their merits. So, we have to be careful in how we support this. Is there any particular area of effort that needs looking at? MK: The great supporter I can think of right now is GIZ in Germany (the German Corporation for International Development.) They’ve been one of the largest supporters on this program. The U.S. government has co-sponsored some events, particularly with organisations such as Five One Labs in Sulaimaniya and Khudairi Group co-sponsored that pitch event in which Five One Labs brought over international investors and VC from the USA with support from the US Consulate in Erbil. So, it’s funny you say that, I agree with you to a certain extent. What we’re seeing now is NGOs and government organisations doing some of the heavy lifting. You’re teaching people how to put together a pitch deck, you’re teaching people coding skills, a lot of the basic fundamentals that maybe are not as focused on within the universities and high school programs within Iraq, so you’re filling that gap. So what I think is really critical is for us to build on that. Like you said, those NGOs are not really looking to invest in the big Careems and Souq.coms, they are looking at the building blocks. But there needs to be many components in order to create what I call a cluster of innovation. Now, that’s not my terminology, but it’s something you see around the world. And if you don’t have the government regulations, if you don’t have the entrepreneurs, VCs, private equity investors, as well as getting the government to start taking real steps to loosen the regulations, you won’t get that ecosystem. IEI: Yes. The regulatory environment in Iraq, certainly for more conventional business, is a key ingredient that needs looking at. For these new tech companies and entrepreneurs, do you think there is any way this could be sidestepped? MK: Absolutely, people of course often talk about the leapfrog effect, bringing in smart government and technology tools and resources. One of the big things here for me is that technology in developing markets can act as a great equaliser. Of course, the tech giants can move in, but even at the smaller level, for everyday Iraqis trying to file a document or deal with bureaucracy, having new means to do so creates real efficiency compared to having to do everything with physical documents that have to be processed by government officials. We need to empower the people in many ways. And Iraq has a really high internet penetration and of course smartphone penetration, particularly in Baghdad. There are new tools people can download and these make people’s lives a lot easier. But to be candid, in some areas the less government intervention the better. In other areas you have to have it. When it comes to the investment regulatory environment, real VCs are not going to go in without knowing what the laws are. They need public, transparent regulations, ideally technology free zones that make it easier to invest in those start ups. So, we’re not talking billions of dollars, we’re talking millions of dollars in investment into basic infrastructure to support that ecosystem. IEI: Yes–you can’t just hope that if you strip away government regulation, a kind of wild west tech economy will flourish, there has to be a balance. So, am I correct in saying you have invested in Miswag? MK: So, in all candour, we have signed terms to the deal, I have been supporting them as a kind of board level adviser. The challenge is to create an investment agreement that will hold up in an international court. Not because I am scared. No– I want to set a precedent in Iraq, so that people can see the terms of agreement. By no means will this be the final agreement that people will use for the next 10 years, but I want to create a framework. So I am dealing with U.S. lawyers, regional lawyers, Iraqi lawyers, to look at this and make sure it holds up. But I want something that is fair to the investor, to the entrepreneur and also something that we can build the ecosystem around. So, I am hoping to open-source log these documents for others to use as well. IEI: So, in that respect, things like the New York Convention (for commercial arbitration) is that a big step forward in terms of protecting the investor? MK: I think these international conventions are very helpful. But I think Iraq just needs to take a lot of steps forward, in the judicial system, just to be a little bit more transparent. I work in Iraq every day, and either the laws are changing or it’s difficult to know what they are. And I am not just talking about technology investment, I am talking about tariffs on getting products in such as steel, these can change all the time. So this is my challenge. I think the more transparent and the more open that government can be in terms of sharing information, you’ll get a lot more investors. I know quite a lot of VCs here in the region and based in California. And they are genuinely interested in Iraq, not from a humanitarian perspective, they actually see a young population, high GDP, rising oil production. There are fundamentals there that are very hard to find anywhere in the world. And the beauty of technology, for the most part, is that it is not a ministry contract you have to sign, these are b2b contracts, and that is very attractive. IEI: In other sectors in the non-oil economy, there’s often a demand to partner with an Iraqi company, and these JVs are sometimes just too complicated to get involved with for the foreign investor. But perhaps in tech, it’s a different story, because rather than looking at an ageing state-owned company and an often obsolete business model, they are already rewriting the rules of the landscape. So do you think there is a lot more potential there? MK: I do, and I think there are some nuances that still need to be addressed, as we mentioned, the regulatory environment. But I think when I invest in a company like Miswag, it’s an investment in a private business and whatever the terms are, those are the terms. It’s genuine private investment. And, other than paying taxes and renewing registration, there is a lot less complexity. And I think a lot about the future of the Iraqi economy and what that’s going to look like. It’s great when oil is $80-85 but as we all know, there may come a day when it is $25 oil, and you can’t have 25% of the country’s GDP based on that. So, I know Iraq has many issues, but really, I truly believe we have some of the best leadership in Iraq in the last decade, since 2003. So I am optimistic. But we really need to start looking to what the future of Iraq’s economy looks like, and we need to start taking big steps towards that, or else we’ll find ourselves in a similar situation to what we found ourselves in in 2014-16.